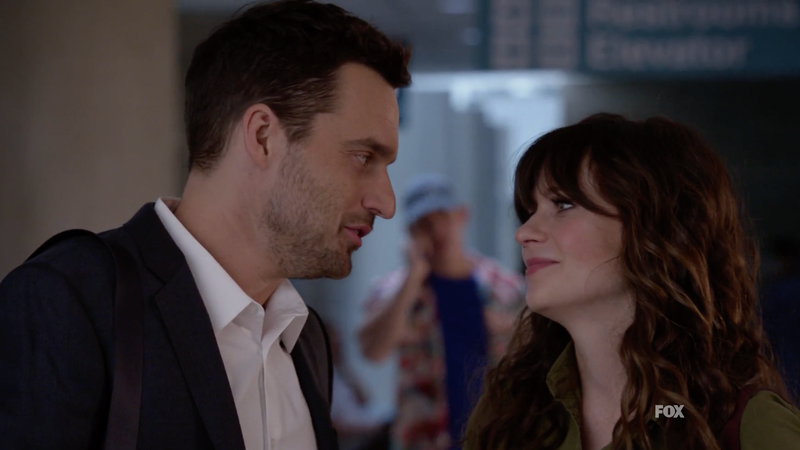 Season 6 of New Girl deliberately ended with what could have been read as a resolution for all the loft-dwellers, particularly the firm, “They will!” answer to Jess and Nick’s will-they-or-won’t-they romance question. The show was renewed for a final eight-episode season, and Tuesday’s premiere made it clear that it probably didn’t need to be. Though it’s been a full year since an episode aired, in the world of New Girl, it’s been three. Happy to report that Nick and Jess are still together; less happy to report that Jess now has a nose ring. The half-hour was mostly dedicated to catching us up on what everyone is up to, with blatant exposition—Winston and Aly are expecting a baby, much to Aly’s annoyance. Cece is still running Cece’s Boys, while Schmidt is a stay-at-home dad for little Ruth, named after Ruth Bader Ginsburg. Even Dermot “Fancy Man” Mulroney makes a magical silver fox appearance, offering Jess a job and injecting the first hint of anxiety into her seemingly stable relationship with Nick. The thing is, we’ve seen Nick and Jess play out this anxiety practically every season the show has been on. It’s even something her ex-boyfriend and future boss observes. They’re both so afraid to move forward (still! ), which is the explanation for why Nick didn’t ask Jess to marry him while they traveled the European leg of his Pepperwood Chronicles tour. Actually, Nick was just planning a stupidly elaborate proposal, in classic Nick fashion. He doesn’t follow through, based off comments Jess makes about how they’re perfect together as they are, even though he’s holding the ring in an envelope from Turkey in his hand. “I don’t need to be married to know who we are,” Jess tells him. “We don’t need to get married.” Sure. Sounds like a wedding finale is in the cards. Watching Nick and Jess fail to communicate with one another about their relationship feels completely played out...again. They’ve done it a million times and it seemed as though they’d finally grown past it in last season’s culmination. If their potential engagement is the central conflict of this final swan song to the series, it’ll be a shame. It’s not really a story that needs to be told again. At the same time, there’s no other ensemble cast I’d rather watch tell it. As frustrating as that plot line has been, getting the gang back together, with their familiar chemistry and crack timing, turned out to be a delight. There are few shows that could justify a scene where a grown man (Nick) ceremoniously shaves another man’s mustache (Schmidt’s) in front of his family and friends. If these final episodes are just used to give us more of that kind of believable absurdity (and more Winston shirts), they’ll probably be joyful, if unnecessary, viewing. What Do We Think of the New New Girl Intro?